My sewing have been on hold for about two weeks because we have been moving. It is quite frustrating getting this crazy urge to sew and then realising everything you need is un-optanable in the bottom of some box, somewear. But the move is not all bad, in fact it is great (once we got everything in order). 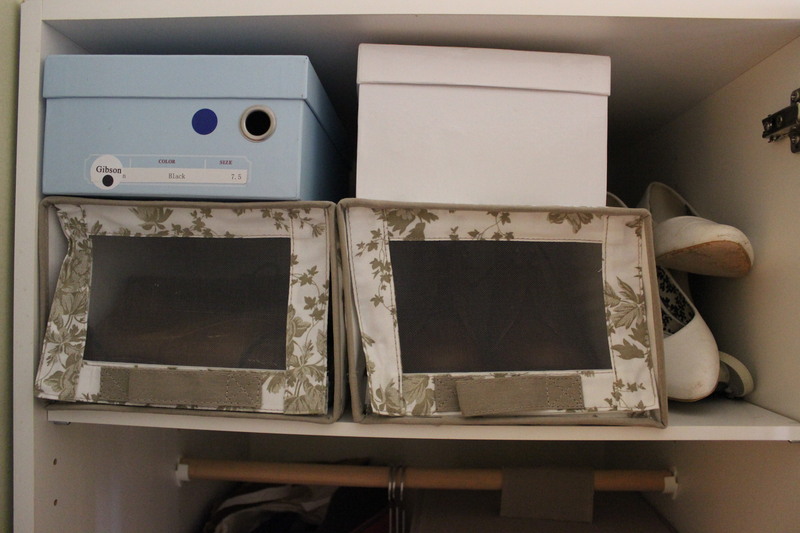 We are up-grading from the various 1-room apartments me and my boyfriend use to live in to a 4-room, and you all know what that means – A sewing room for me! I think that’s the thing I’m most exited about. 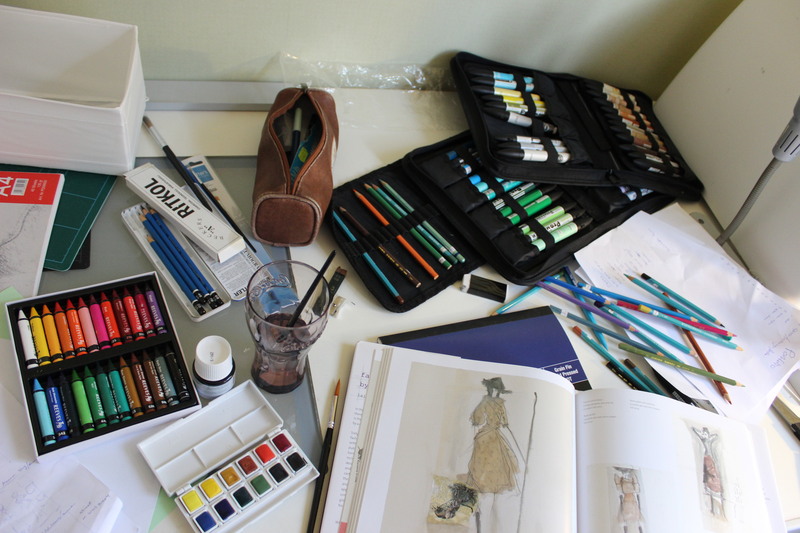 And I need to force myself to split my time to get the other rooms in order too – not just “my” room. 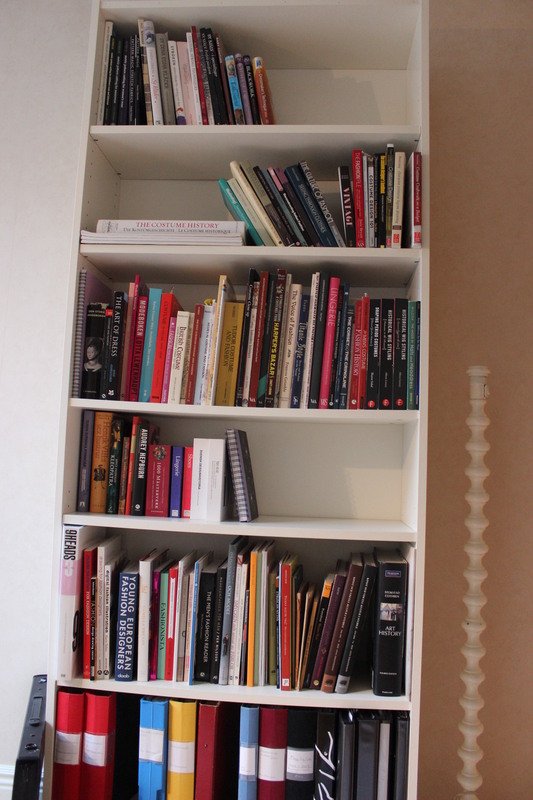 But it is fun to try to figur out the best way of putting the furniture to get the most out of the (smal) room. So lets take a look at what I got so far. 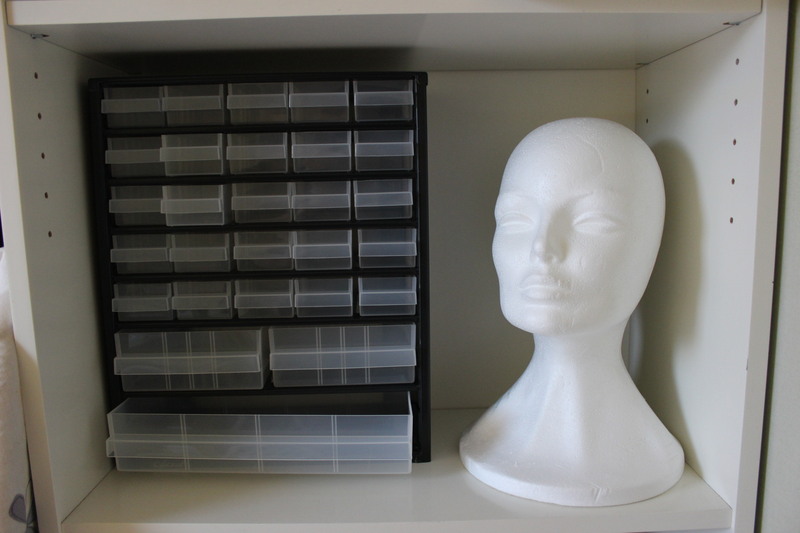 A cheap bookshell for varyous sewing tings, and boxes of tooles and fabric. All within close reach. Yesterday I picked this up at a hardwear store. It’s ment for carpenters to keep their nails and such. But it is also perfect for buttons, snaps, ribbons, zippers and everything else you will need. One of my demands for this room was a wardrobe. And as you can se I’ve stuffed it full. 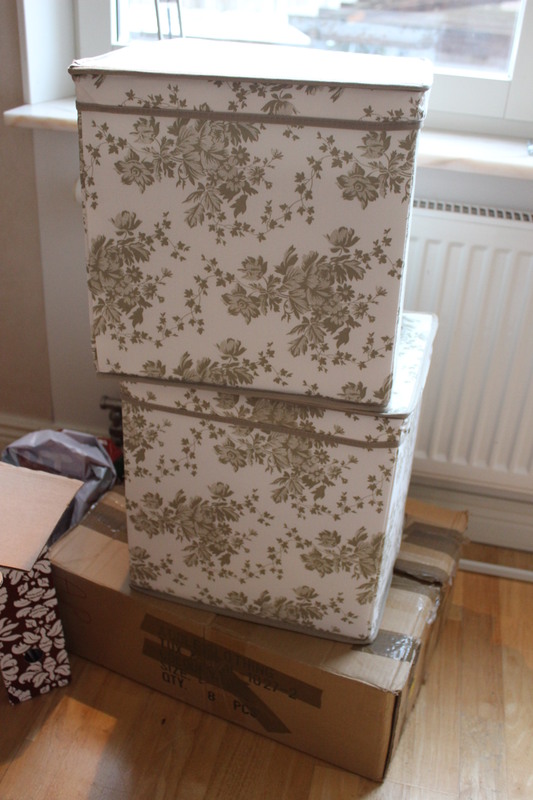 The bags and big boxes conains fabric and will be sorted and stored in our basement. And I need at least one shell for my historical shoes. This next thing is something I’ve been dreaming about for a long time. 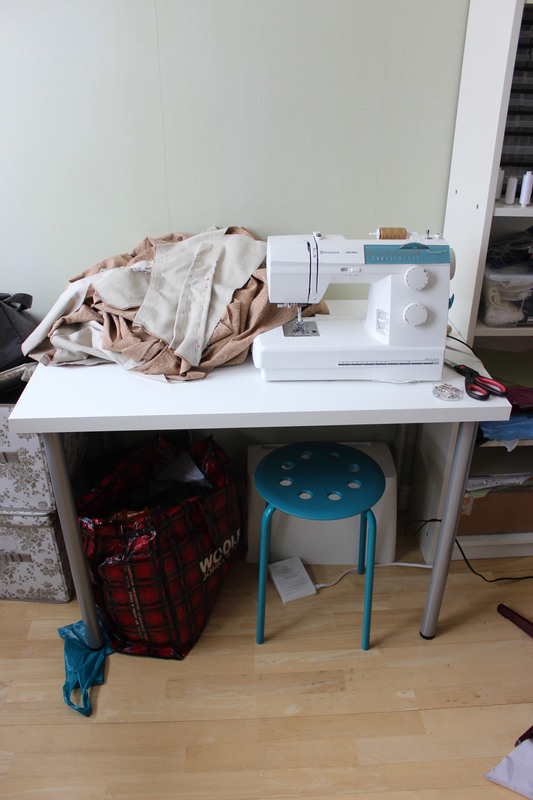 To get all my fashion and sewing books gathered at on place. And now I have it. One hole bookshell for my sewing literature (there are also some books about art, design, textiles and historical people). These two shells are reseved for my historical costuming. I think I will need some more books, to cover the holes in the ranks. 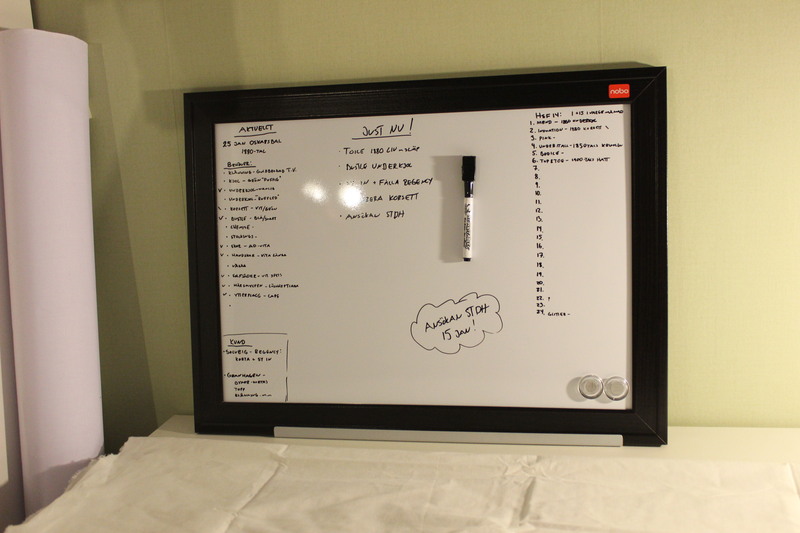 And trying to be a bit more organized this year, I got a whiteboard to write all the necessary “keep in minds” on. Like HSF challenges, costumers info, up-coming events and what I will wear (and need to make) for it. And as my cuting/drawing table I got this arcitects table from my boyfriend (It has a glas insertion, which can be lit from beneath, to help copying drawings). Sorry for the mess. 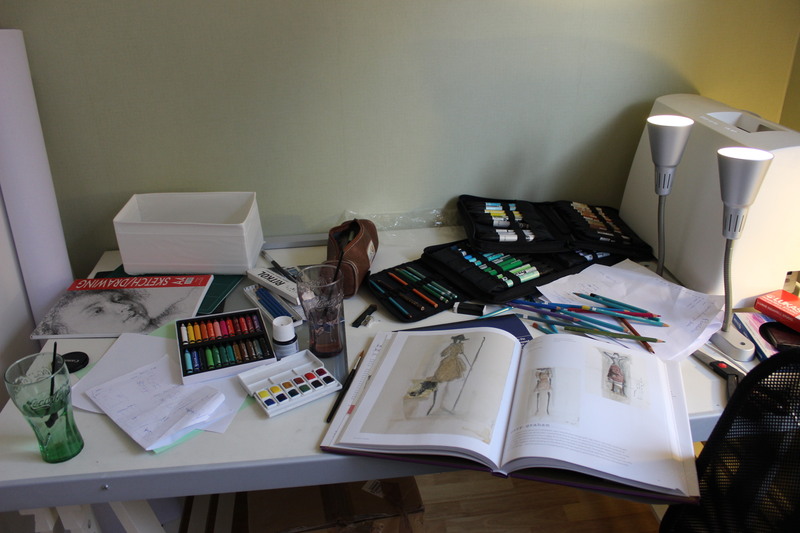 (Last week I was busy polishing up my portfolio for aplications to a school). 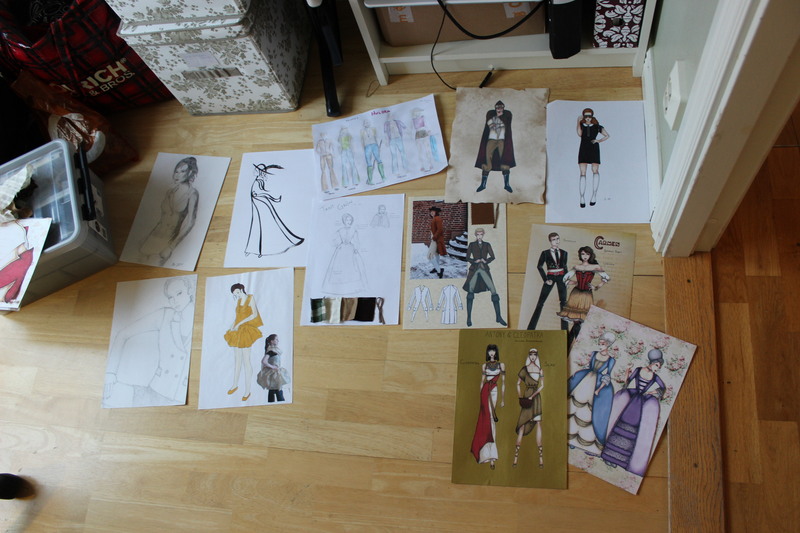 And the best way to get a overview of yor work is to trow them all on the floor (ehm, no). And this week my room has changed again. 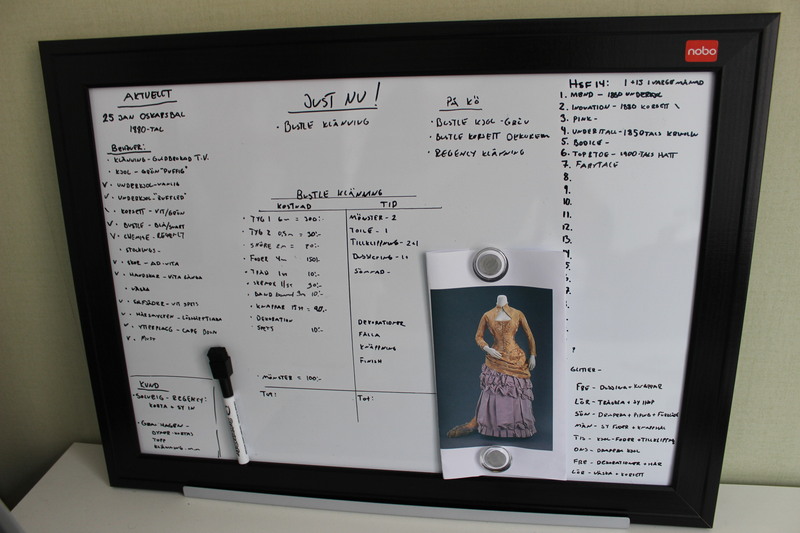 Now the focus lies on the 1880s opera gown, and trying to keep track of both time and money spent on the dress. 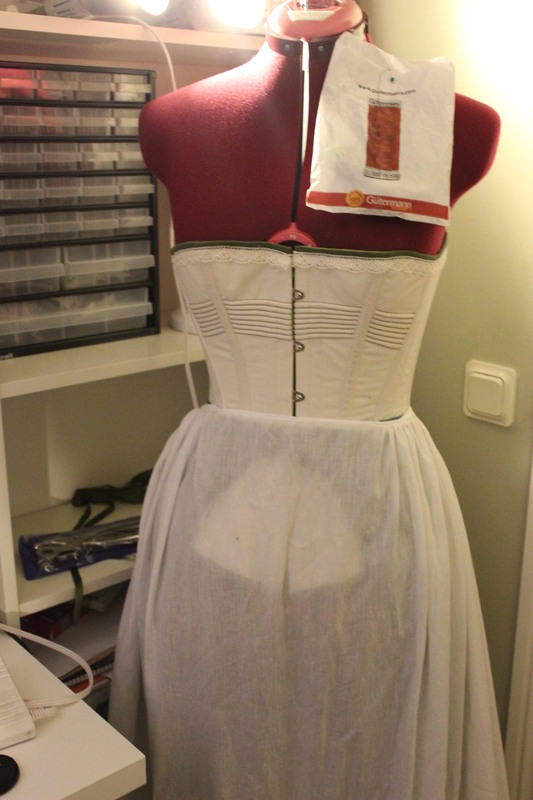 The dressform also fits into the room (barely). 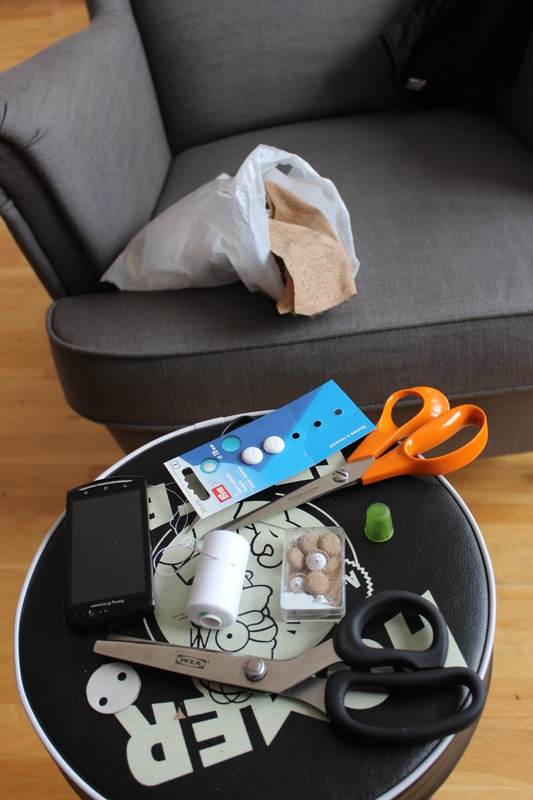 But I will continue to do most of the handsewing in the couch watching movies. 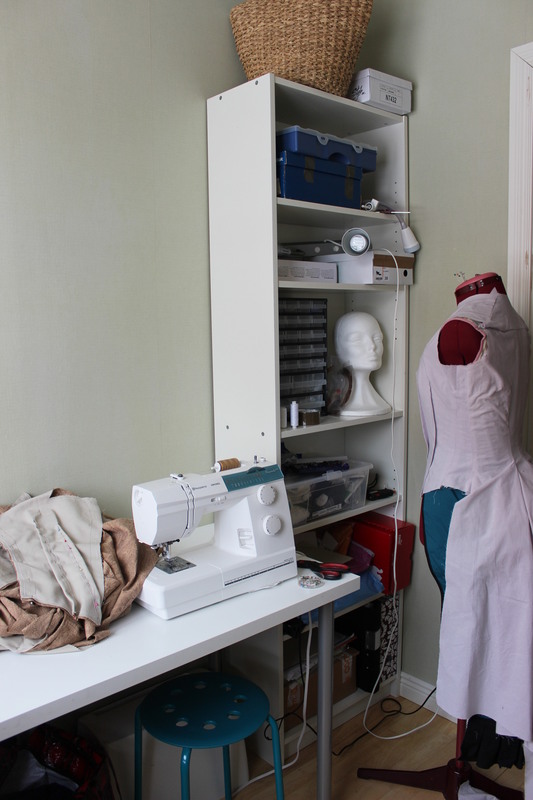 I’m really happy about my sewing room, but I guess it will take a while to figur out exactly how to keep everything in the best way. this looks like a dream room for me (leaving in a 1-room flat)! 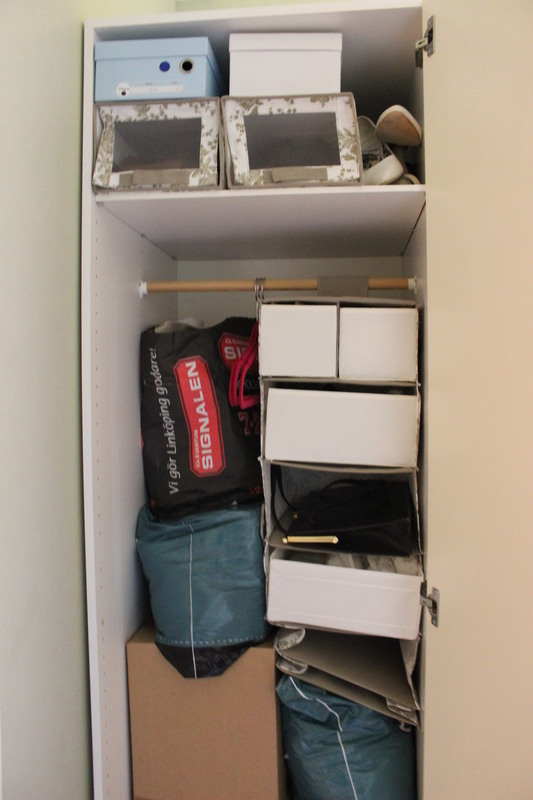 Yeah, I’ve also used to “make do” in different smal apartments, so it feels great to finaly have all my things in one place. 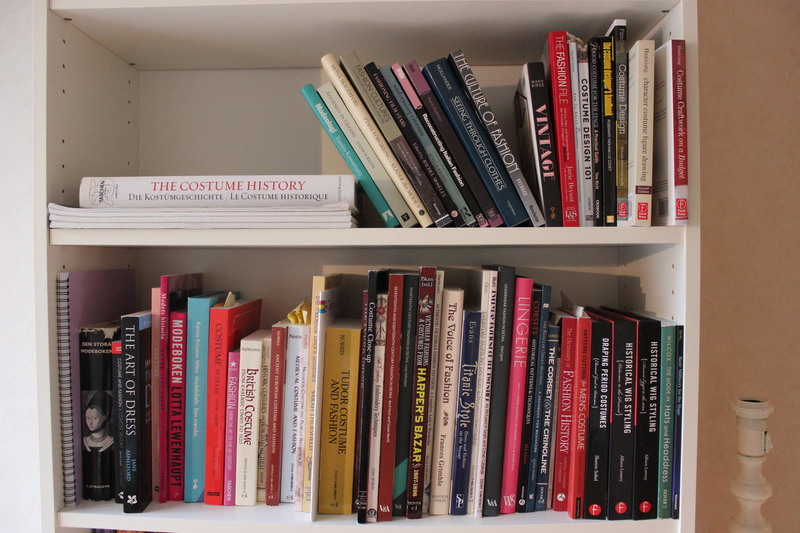 Wonderful sewing room and all these books… Hoping to get a sewing room of my own, too, when I have to move later this year. 🙂 Have fun with finishing to set it up.